It’s been a while since my last homebrew post on here, so I figured for my birthday and the release of Super Smash Bros. Ultimate today I’d make a new batch of homebrew to tackle one of the biggest problems in D&D 5e. The problem? Whips being practically useless in their current state! It’s a travesty that I cannot make a character in the spitting image of Simon Belmont without feeling like the whip is the least powerful part of the character. Seriously, his handaxes would have a higher range and deal more damage. Whips in their current state are an issue even outside of roleplaying everyone’s favorite vampire-slaying family. Plenty of other famous characters use whips and look slick as hell doing so. You’ve got Indiana Jones, Catwoman, and most importantly, Nicholas Cage as Ghost Rider. Something must be done to right this wrong, and I’m just the person to do it. As-is a whip is basically just a dagger that deals slashing damage and has a 10 ft. reach. However, it’s actually a bit worse than a dagger since you can throw one 20/60 ft. So a dagger theoretically deals the same damage, also has the finesse property, and has a longer range than the whip. I say theoretically because the action economy does come into play here. For any melee character with extra attack, a whip does pull-ahead in the long run. This is because you can only draw/stow so many daggers per turn, whereas the whip you can keep using without having to worry about drawing/stowing a new weapon. But with that being said, the same classes with extra attack that would benefit from using the whip over throwing daggers also have access to way better weapons. If you want a reach weapon you could use a glaive and if you want a one-handed finesse weapon you could use a rapier. Sure it’s a one-handed reach weapon, but quite frankly the benefits of the whip don’t outweigh the benefits of most of the other weapons you could pick from as a martial front-line character. However, whips are not poorly-balanced. They are a one-handed finesse weapon with reach. Only dealing 1d4 damage in exchange for those properties is fair. The problem is that it’s a niche weapon without a niche. You know who loves finesse weapons? Rogues. You know who doesn’t have proficiency with whips? Rogues. I feel like this had to have been an oversight or something. Whips are practically made for rogues. They are a finesse weapon with reach. This would give melee rogues an extra 5 ft. to work within melee distance. Realistically one could argue that this is the reason why rogues miss out on whip proficiency. They don’t need extra bonuses to their maneuverability with cunning action. Yet, so many rogues already use bows or crossbows which gives them even more distance between the enemy compared to a whip. The whip wouldn’t replace a dagger for rogues either. First of all, whips aren’t light weapons. This limits them as an off-hand weapon choice whereas daggers would still be of use there. Daggers also are able to become thrown weapons in a pinch. Both weapons keep their identity and usefulness in a rogue’s arsenal. If we give rogues proficiency with whips the weapon now has a niche. A class without access to other reach weapons now has one that they can rely upon. It’s also a weapon that can still trigger sneak attack which at the end of the day is all a rogue ever wants. There’s also another way to make the whip useful instead of just giving rogues another new toy to play with. Instead, we could create a proper niche for the weapon so that martial classes, in general, might consider it. Taking a look at the whip’s mechanics we can clearly see that there’s a niche carved out for the whip. It’s not a heavy-hitting damage-dealing weapon. It’s a weapon for a dexterous front-line character that wants to use a shield but still stay just out of reach of enemies. This character’s goal is not necessarily to deal damage but to harass their enemies and manipulate the battlefield with a reach weapon. While hiding behind a shield of course. What if we gave this character a way to become more of a crowd control role? If they’re willing to use a whip instead of any of the other great one-handed weapons they’re not heavily invested in dealing a lot of damage. My idea is to create a feat that allows the user to use the whip to control the enemy utilizing their whip’s reach. A feat makes it a) optional, b) an investment and c) makes a character better at something they’re already doing. All 3 of these points are basically the justification for any feat in 5e. Fun fact, the prototype for this feat is a magical fishing rod I made for one of my players. There are so many examples in media of whips being used to restrain or trip an adversary. In fact, it’s probably one of the cooler uses of a whip. With that being said, let’s make a feat to give a whip wielder some tools to provide this type of crowd control using a whip. The closest thing I could think of to these mechanics are the Grapple and Shove actions. 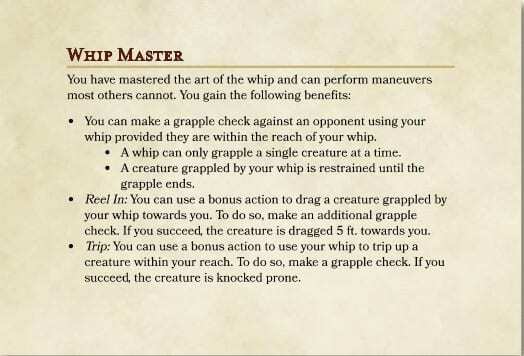 ThinkDM has a great article on grappling in 5th edition and how the base grappling feat is weak, so with that in mind, I wanted to make sure that the whip’s grapple wouldn’t have the same fate. I like the idea of having a grapple check restrain a creature and it makes sense thematically if you’re able to wrap your whip around the creature. Trip using a bonus action to try and shove a creature prone is fair in my opinion. First of all, it requires you to not be using your whip to restrain a creature. Secondly, knocking a creature prone can be a risky maneuver since they’ll gain some additional defenses against the attacks of your ranged party members. Having Reel In only require a bonus action was a difficult decision, but I believe it’s fair. Originally I was worried about a dual-wielder using Reel as a way to gain 5ft. of movement while imposing the restrained condition on an enemy that they could still hit with a one-handed weapon. That being said, you’ll need to use an action, a bonus action, and make 2 successful Strength (Athletics) checks to pull it off. That’s a hefty chunk of your action economy to pull off this maneuver. Check out the Castlevania wiki for more Vampire Killer lore! 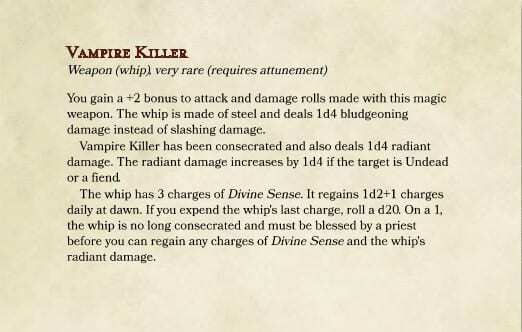 Vampire Killer is unique in that it’s a whip but has the head of a flail or mace attached to its end. It’s also a holy weapon made specifically to, you guessed it, kill vampires. Because of this, I’ve given it a mini Divine Smite attached to its damage. In the Castlevania series, Vampire Killer, is an artifact of the Belmont Clan and has been passed down many generations to slay Dracula wherever and whenever he pops up. Naturally speaking, it must be a powerful item hence the +2 bonus to attack and damage. I’ve also taken some creative liberties and given it a feature to aid the user in their search for creatures of the night. It holds a maximum of 3 charges of the paladin’s Divine Sense ability. Learn more about Runescape’s Abyssal Whip here! One of the most iconic whips from my gaming experience is the Abyssal Whip from Runescape. You were a real god of the schoolyard if you had one of these babies back in Middle School. I took inspiration from the Old School version of the Abyssal Whip for this interpretation. The special attack of the Abbysal Whip in Runescape was to drain an enemy player’s run speed. Special attacks are a bit difficult to translate to D&D 5e, so I opted for it to be a free proc on a natural 20 instead. I wasn’t certain how to go about showcasing the slow effect as in the game it drains the enemy player’s stamina and replenishes yours. This is a unique effect, but hard to directly translate without making it overpowered in D&D 5e. Instead, I opted for it to simply half the target’s movement speed for a turn. The Abyssal Whip is a powerful weapon and extremely accurate. I decided to give it a +1 to hit aid in its accuracy and 1d4+1 additional slashing damage. Honestly, I balanced the weapon around the fact that you’ll only get its slow effect 5% of the time and even then it’s not super powerful. This way you essentially get a +2 weapon with a small, flavorful perk. More info on Ghost Rider’s weapon can be found here. I promise this is a Nicholas Cage-free link! It pains me to say that the most powerful whip I created was not for anyone in the Castlevania series. No, it was for Nicholas Cage. That being said, there was really no way to recreate Ghost Rider’s Chain in D&D 5e without making it a legendary magical item. Seriously, this thing is ridiculous. Ghost Rider’s Chain is a magical whip that bends to the will of Ghost Rider. It can be telepathically ordered to do pretty much anything such as lasso a creature. I figured that allowing it to cast Hold Person and Hold Monster was a great way to reskin this feature. Ghost Rider can even magically extend the length of the chain. Allegedly there is no measurement of its maximum length, but I figured a 30 ft. range was more than fair for D&D 5e, mechanically speaking. He can also set the chain ablaze, hence the additional fire damage and Flame Tongue-esque light. This is a heavy chain sort of like Vampire Killer, but it has a bit more weight to it. Because of this Ghost Rider’s Chain deals 1d6 bludgeoning damage instead of 1d4 like the rest of the whips. Oh, and the best part of the weapon is the fact that you can cast Disintegrate. I mean, it’s canon, I couldn’t resist. The WoW Succubus is an inspiration from this weapon. It’s not a direct-translation like the other whips! I had to go back to my days of World of Warcraft when I played a Warlock during The Burning Crusade for this whip. The Warlock has a summonable pet Succubus that used a whip in battle and could charm enemies to incapacitate them. Pretty straight-forward. This is a simple, but flavorful weapon. A succubus is a creature that can deal some damage, but use its demonic powers to infatuate a target to the point of incapacitation. 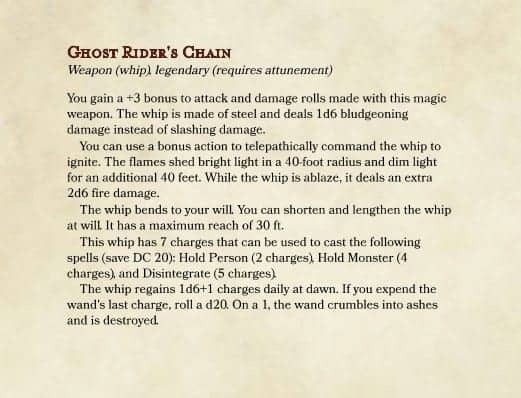 So with that in mind, I wanted to create a whip that could serve as a solid offensive weapon, but have the ability to charm creatures as well. Like Ghost Rider’s Chain, the Succubi’s Toy is a whip that is able to cast spells using some stored charges. Charm Person is only a 1st level spell so I felt that a single charge per cast was fair. 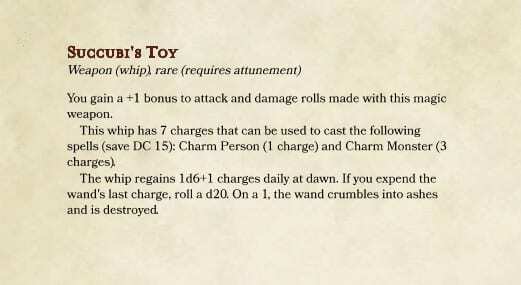 Charm Monster is a bit more powerful, so I gave it a cost of 3 charges to keep it in-line with similar items that value a 4th level spell at 3 charges. 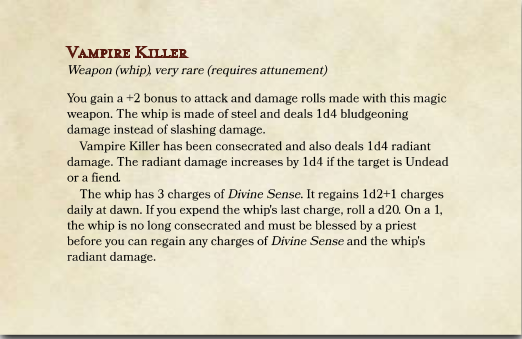 I gave it a +1 to hit and damage so that the whip stays relevant to the user even when they’re out of charges to cast spells. A +1 modifier seems fair considering how many people or monsters you’re able to charm with a fully-charged Succubi’s Toy. Whips are fun, flavorful, and iconic weapons. It’s a shame that they’re so mechanically lacking in D&D 5e. As-is they’re just daggers that have reach. Hilariously though, you’d be better off wielding a dagger since it has a 20 ft. thrown range compared to the whip’s 10 ft. reach. One of the biggest issues is that a rogue would be great with a whip but they can’t use one since they lack proficiency with whips. Giving rogues the ability to use whips gives the weapon a niche without changing anything mechanically. Other martial classes have access to way better reach weapons and one-handed weapons so the only reason they’d bother with whips is for a flavor choice. Ideally, you shouldn’t have to choose between flavor and decent optimization. This is the main reason why I created the feat. By taking the feat, Strength-based fighters or barbarians may want to use a whip to grapple their foes and drag them around the battlefield. This way you’re not choosing between flavor and damage, you’re choosing between damage and crowd control. It feels more fun. Unfortunately, I haven’t had a chance to playtest the feat or the items just yet. That being said, when I do I will certainly be sure to revise everything as needed. If you have any balance suggestions please feel free to share them! That goes double for any new whips since I’m sure I missed out on creating a few iconic ones.